Many women feel both love and fear for bronzer. Love it, because it can wake up pasty, tired skin. Women who wear bronzer convey a elegant feeling. While the application of this great staple really needs some basic know-how to avoid odd looking. Here are tips to tell you how to apply bronzer properly. The problem of selection is very important. Just as you have to choose a proper blush, foundation, you need a proper bronzer which matches your skin color and skin type. According to your skin type, pick the right bronzer and use the correct way to apply. If you have oily of normal skin, powder-based bronzer is best. Apply it with a short, fluffy blush brush after you blow the excess bronzer off brush. If you’re dry skin, apply cream or gel-based bronzer with finger or a sponge. Blend well is the key to most cream-based products. For different skin colors, the choice also varies. A rule of thumb here is never choosing a shade more than 2 shades darker than your skin. 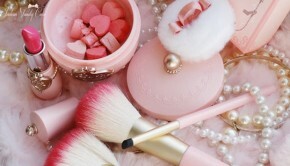 Peach or pink bronzers are best for the skin which is fair and sunburn easily. Olive skin tones prefer copper shades, while dark skin needs darker shades. Orange shade always looks unnatural. So, give it up. Also, you need different shades to meet the need of different seasons. Darker one for summer, lighter one for winter. Bronzer application is never the simple coverage of the whole face. The necessary spots for bronzer are the forehead, nose, cheeks and chin, where the sun can naturally shines. Bronzer alone would look dull. Apply your cheek “apples” with cream blush for a dewy look. But, you don’t need much foundation.